There is no shortage of superlatives to describe the passenger traffic growth between China and Japan. Chinese visitors are quickly becoming Japan's single largest tourism source. China Southern's Japan passenger numbers in the first nine months of 2015 have exceeded its traffic for the full year 2014. 14 Chinese airlines intend to serve Japan at the end of 2015, including five carriers which have entered in 2014 or 2015. China's Spring Airlines has virtual bases at Nagoya and Osaka Kansai and is planning to construct hotels in Japan to accommodate the visitors it is bringing over. Japan's LCC sector is vibrant, with five start-ups in four years. They have helped rejuvenate Japanese traffic despite the shrinking economy and decreasing local population. Yet they have remained absent from the China-Japan market. 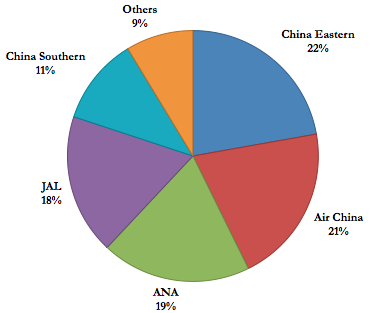 The 2012 China-Japan territorial dispute weakened travel conditions, and since then the local LCCs appear to have felt overwhelmed by the influx of Chinese carrier capacity. This will start to change: AirAsia Japan plans to launch in Mar-2016 and eventually serve China, a market its affiliate carriers know well. Spring Airlines Japan, the locally established JV of Shanghai-based Spring, will finally commence international services in 2016 and is making two Chinese cities, Chongqing and Wuhan, its first destinations. Despite the growth already witnessed, this is only the beginning for the market. Japanese LCCs will have a role in its expansion. AirAsia Japan (Mk II) is the second attempt by the AirAsia Group to establish a foothold in the hotly-contested Japanese airline sector. The group's first iteration commenced operations on 01-Aug-2012. The airline was a joint venture with All Nippon Airways. In Jun-2013, ANA Holdings acquired AirAsia Group’s shareholding in the JV, creating Vanilla Air, a wholly-owned subsidiary of ANA that still operates today. The airline operated under the AirAsia brand until 31-Oct-2013. AirAsia Japan Mk II was formally announced in Jul-2014 and applied for an Air Operator’s Certificate with the Japan Civil Aviation Bureau on 21-Jul-2015. At the time AirAsia Japan expected approval as early as Oct-2015, and that eventuated with an 06-Oct-2015 approval. Despite receiving approval, AirAsia Japan does not expect to commence operations until Mar-2016. Whereas AirAsia Japan Mk I operated out of Tokyo Narita, AirAsia Japan Mk II will be based at Nagoya. 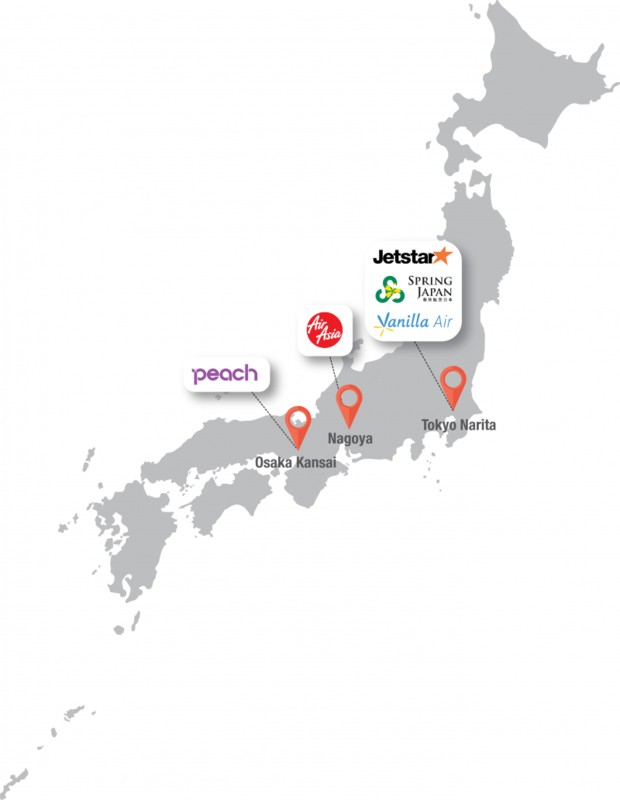 There is no locally based LCC there, although Jetstar Japan has a mini hub there. Narita has become a major LCC base, with Jetstar Japan, Spring Airlines Japan and Vanilla Air based there (Spring Japan launched after AirAsia Japan Mk I stopped services). Additionally, Peach has a base at Narita. Not only is Nagoya less crowded (but with a smaller market than Tokyo), it is one of Japan's few airports to have 24-hour operations. The Narita curfew has impacted LCCs. Seeing the traffic volume success of LCCs in Japan, Nagoya wooed AirAsia Japan. AirAsia Japan hopes to move into Nagoya's purpose-built low cost terminal by 2018. The Nagoya LCCT follows low cost facilities at Tokyo Narita, Okinawa Naha and Osaka Kansai. The facilitation of these low cost terminals – and AirAsia Japan Mk II being Japan's fifth LCC in four years – would have been unthinkable a decade ago. These developments, along with Japan's opening of Tokyo Haneda and liberalisation via open skies agreements, are leading domestic and international traffic to grow. Domestic traffic is approaching previous record highs despite Japan's slowing economy and shrinking population. 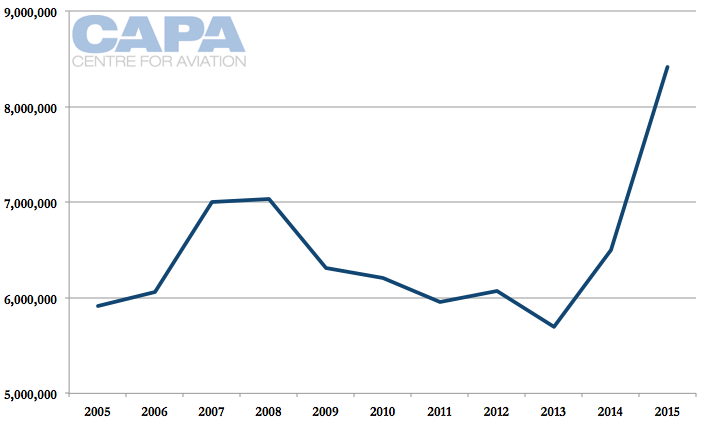 Financially, however, only Peach Aviation has to date consistently posted profits. By the end of 2016, AirAsia Japan expects to have six A320s, adding five aircraft each additional year, so ending 2017 with 11 aircraft and 2018 with 16 aircraft. There are options on two additional A320s for 2018. AirAsia Japan CEO Yoshinori Odagiri said the carrier could be operating at least 120 services to/from Nagoya Chubu Airport by 2020, exceeding All Nippon Airways, which is the largest carrier at Nagoya Chubu, currently operating 90 daily departures and arrivals at the airport. Fukuoka and Sapporo are unsurprising picks given they form Japan's domestic trunk market along with Okinawa. Tickets are not yet on sale. International services generally take longer to receive approval. There is no exact time frame for AirAsia Japan's international routes. Both Peach and AirAsia Japan Mk I were able to launch international services relatively quickly after their domestic launch. Jetstar Japan initially focused on the domestic market (shareholder JAL is smaller than ANA in the domestic market and wanted to build a larger group footprint). By the time Jetstar Japan wanted to launch international services, it had fallen under the scrutiny of regulators for not meeting its internal safety practices (these were above Japan's minimum requirements, which Jetstar Japan was meeting). Jetstar Japan's Osaka Kansai base was also delayed because of this. Spring Airlines Japan launched on Aug-2014, initially with token domestic services; its objective was to serve Japan's international market, and in particular Japan-China. CAPA - Centre for Aviation will hold its second Japan LCC Aviation Summit in Japan in Jun-2016. For further information, please contact CAPA Japan LCC Summit 2016. Initial Japanese LCC international markets of Seoul and Taipei were safe bets given the strong traffic, inbound and outbound, and ease of market conditions. Mainland China was a medium term interest of Peach Aviation, which was willing to serve Beijing and Shanghai Pudong using the midnight hour slots only available at those airports. However, a political territorial dispute in late-2012 fomented anti-Japanese feelings, and China-Japan passenger traffic fell, creating unsuitable conditions for entering the China market. China-Japan traffic has recovered and exceeded past highs. Seat capacity is at record highs. Chinese tourist numbers to Japan are recently approximately doubling year-on-year. 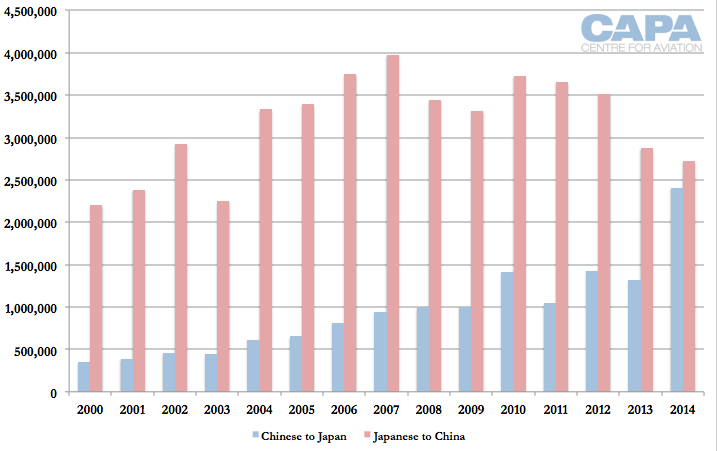 Chinese visitors to Japan are overtaking Japanese visitors to China. The growth is a combination of the outbound Chinese market growing - at the same time as the Japanese outbound market declines. However, total market volumes are growing. 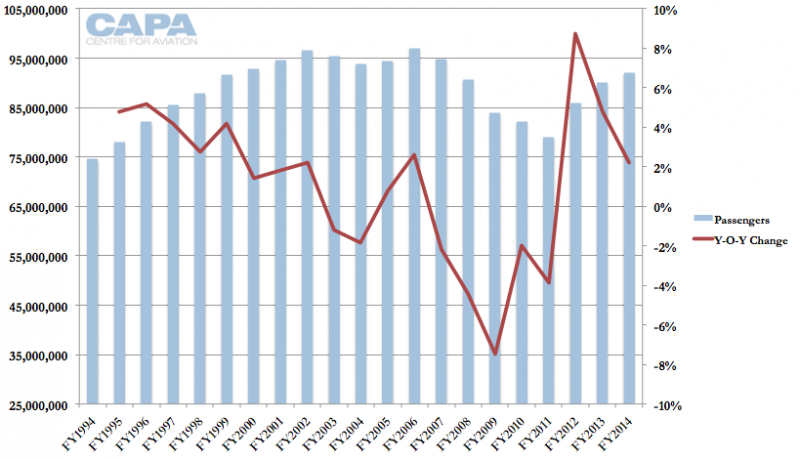 Japanese LCCs remain conservative. As CAPA previously noted: Vanilla is cautious of the mainland Chinese market, given the cost advantages of Chinese carriers, the lack of slots at primary airports and perhaps challenging yields out of secondary cities. China is becoming an outbound market and Vanilla would need to establish a local network, and forge partners, to make mainland China work. The market has become more competitive, with the balance tilted towards the Chinese side. 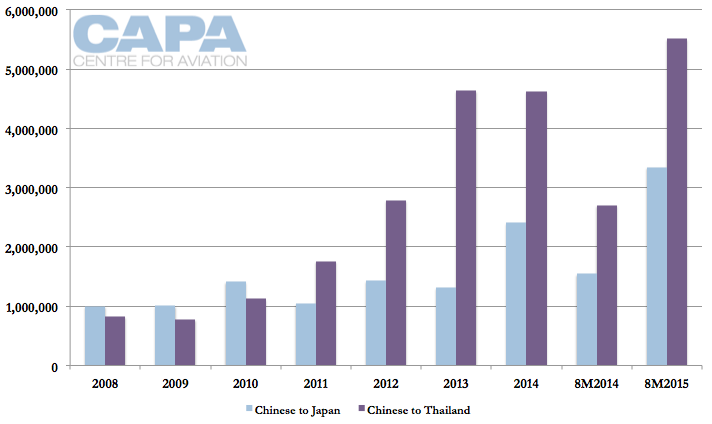 Chinese airlines have increased their share of the Japan-China market from 58% in 2010 to 67% in 2015. 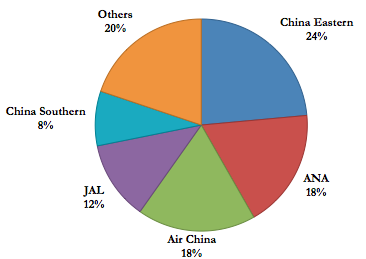 In 2005, six Chinese airlines served Japan. 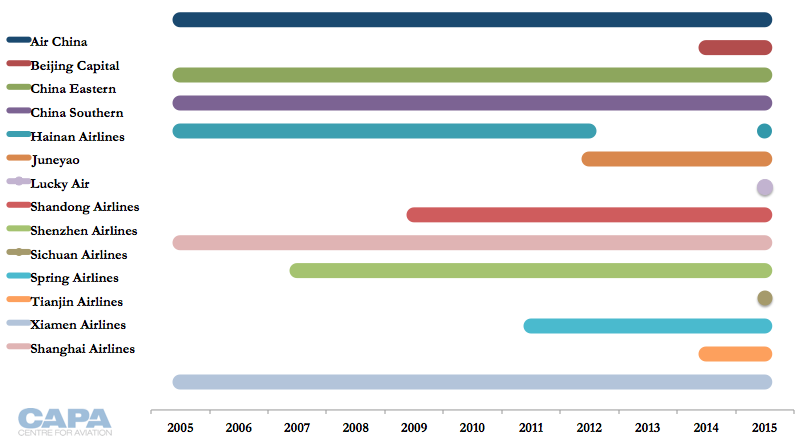 By 2010 this increased marginally, to seven. But in 2015, 14 Chinese airlines now serve Japan. This includes five Chinese airlines that entered (or re-entered) the Japanese market in 2014 or 2015. AirAsia Japan has not given details of its prospective China operation, aside from the fact it intends to enter the market in the near future. However, this is the biggest commitment from Japan's LCCs (aside from Spring Airlines Japan). The AirAsia Group already has an extensive network in mainland China comprising 17 cities at the end of 2015. Operationally, this enables the carrier to piggyback on existing infrastructure/contracts. Commercially, AirAsia Japan can use the distribution networks and agency relationships other AirAsia carriers have already put in place. Like Thai AirAsia, AirAsia Japan is well placed to serve mainland China, with almost all major, second and third tier cities within narrowbody range of their respective bases, Bangkok and Nagoya. The exception for AirAsia Japan is far western China, but this is a very small market. AirAsia Japan will also be able to serve Northeastern China, which can be too far for Thai AirAsia. Chinese visitors to Thailand are more numerous than Chinese visitors to Japan. However, visits to Japan are rapidly regaining their lead (until 2011, Chinese visitors to Japan were more numerous than to Thailand, although these markets were in their infancy). It is expected that over the long term Japan will receive far more Chinese visitors than Thailand. Having local operations in both Japan and Thailand is a significant play on the Chinese market for AirAsia, whose main operation in Malaysia has more limited prospects for inbound Chinese tourism. The China market can change quickly, and Thai AirAsia is detecting slowing growth in outbound Chinese travel. Chinese visitor numbers to Thailand however remain up as Chinese airlines are growing quickly in short haul international markets like Thailand. Their growth in Japan is already well established and is far from scratching the surface. Whereas Thai AirAsia had an advantage over sleepy Chinese carriers a few years ago when it ramped up its China network, AirAsia Japan will enter a more hotly contested market. And yet AirAsia Japan probably has the strongest prospects in China of Japanese LCCs, excluding Spring Airlines Japan. Spring Airlines Japan, the Japanese joint venture of Shanghai-based Spring Airlines, has flown only domestic routes since its Aug-2014 launch. Spring Airlines Japan was envisioned to serve Japan's domestic market as well as regional international points. Its focus overall is on mainland China. Spring Airlines has been unable to secure Chinese approval to fly certain China-Japan routes, namely highly sought access to Tokyo Narita. Spring Japan's founding was heavily based on restrictions the carrier faced in its home (mainland China) market to serve foreign markets. This is different from AirAsia and Jetstar, among other LCCs, establishing overseas affiliates because the foreign, not home, market imposes restrictions. Spring Japan has flown three short round-trips from Tokyo Narita. This flying could easily be accomplished in one day with one aircraft, meaning it has significantly under-utilised its fleet of three 737s. The Japanese unit has incurred large losses that Spring Airlines (China) has admitted were significantly bigger than planned. This has been due to longer than expected JCAB approval to commence international flying. Spring Japan on 04-Nov-2015 announced new international flights, with three weekly Tokyo Narita-Wuhan service from 13-Feb-2016 followed by four times weekly Tokyo Narita-Chongqing service from 14-Feb-2016. Although this will help with fleet utilisation, Spring could easily double this flying with its existing fleet. Spring Airlines (China) has about a 9% share of the China-Japan market but has been one of the lead contributors of growth in recent times. 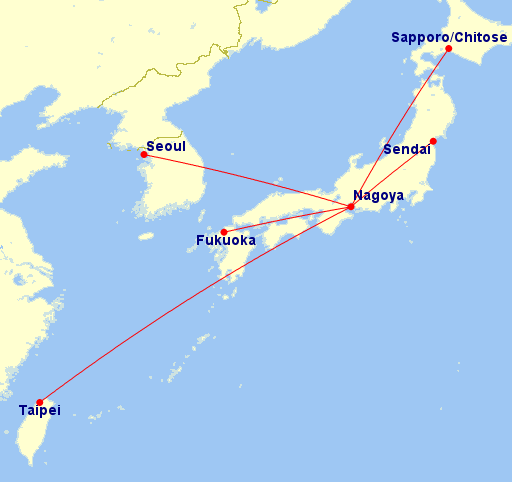 Its China-Japan network is comprised of three main elements: services from its home Shanghai base to multiple Japanese cities (see first map below), and then virtual bases at Nagoya and Osaka Kansai (second map below) to access numerous Chinese cities. Spring's Nagoya-China network should be a concern to AirAsia Japan. Spring Japan's inaugural international services to Chongqing and Wuhan are to destinations Spring (China) links with Japan, but not Tokyo owing to Chinese restrictions. Spring Airlines has also been able to access limited midnight slots at Tokyo Haneda, which it uses to link with Shanghai. It is true entering China will not be easy for Japan's LCCs like Peach, Vanilla and even Jetstar Japan. But others have made it work – and not just the large AirAsia Group, whose size does not make it an equal comparison to Northeast Asia's smaller LCCs. Korea's LCCs, most of which have no full service airline ownership, have had to find their way in China. And have done well. In fact, they would be bigger were it not for regulatory constraints imposed by China. They have been able to link secondary and tertiary Chinese cities – and thus not worry about slot times in Beijing and Shanghai – with Korean cities big and small. Japanese carriers may see Chinese airlines, even full service ones, as LCCs - such is the difference in cost between Chinese carriers and Japan's full service carriers. This does not preclude a role for Japan's LCCs. They have the opportunity to expand in the China-Japan market before more Chinese LCCs enter and Chinese full service carriers continue to expand. Serving China may require more work and willingness to take risk, but with Chinese visitor numbers doubling, the opportunity is far too big to be ignored.